Puzzle of space creature is yet to be unsolved, but now scientist invents such a radar signal which can send messages to far spaces. IN experiment they observe that these signals easily crossing through a 240 meter thick Rock and get shape of a word. This technology (radar signal) also has many more benefits for example by using radar signal technology we can easily communicate with submarines in depth of sea. Now the size and weight of transmitter and receiver of radar signal was in tons. This is a newest technology in communication. By using this technology now it is easier to send messages to any other planets. This communication technology works by using NEUTRINOS, which is a subatomic particle. The practical use of this technology on large scale is not started yet because of its big weight, but this technology also opens lots of possibilities. 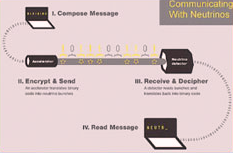 Messaging using neutrinos does not need any satellite or cable. This is invented by scientists of Chicago, America. And there are infinite chances of use of it in military. The property of neutrinos is that they can easily penetrate and pass through from anything which comes in their way. Before the invention of this technology it is very difficult for submarines to send messages to the control room or outside the sea but now this problem is resolve by using radar signals technology.